Brentwood Home Makes Your Bed. Naturally. Online. Log onto Brentwood Home’s website, and before you even get to think about buying a mattress or a pillow (or a dog bed), you’ll find yourself reading up on the healthy, natural materials they use to make your mattress: Bamboo. Organic cotton. Wool. Kapok. Organic latex. It’s easier to keep products healthy when you control the manufacturing process yourself—and that’s just what Brentwood Home does. The company designs and handcrafts 98 percent of the products it sells, working with another local, family-owned company for eco-friendly dyes. Brentwood Home’s backstory goes back a long way—to the Vietnam War, and Vy’s father, Le Duc Nguyen, a former South Vietnamese helicopter pilot and ex-POW. Le Duc escaped from Vietnam, with his four kids, on an 80-person wooden fishing boat. “We did the whole boat thing,” Vy remembers. The Nguyen family were refugees in Hong Kong for a year. Finally they immigrated to southern California where Le Duc got a job working at a furniture store. Soon he worked his way up to a salesman’s role. He ended up partnering with the owner to open four or five additional furniture stores. Then, in 1987, Le Duc and his partners decided to start their own small mattress factory. That’s how the Nguyen family got into the mattress business. After he graduated from university, Le Duc’s son Vy joined several of his high-tech pals in an internet start-up called Pricegrabber.com. It was a pricing-comparison website, and Vy got an in-depth look at how ecommerce actually worked. Using his dad’s contacts he tried selling a few mattresses and pillows online. Then, in 2009, just as the recession was hitting, Vy bought out his father to take control of two mattress factories. Soon he was developing his own Brentwood Home items. Vy’s siblings helped. In fact, all four siblings now work at Brentwood. Le Duc is retired. When Vy started Brentwood Home, the operation included 30 people. Today, the company employs around 170 staffers—some 130 of them working in the 230,000-square-foot factory in Pico Rivera, ten minutes south of the main office in downtown Los Angeles. Brentwood Home sells mattresses, but more to the point it sells mattresses online. Typically this line of business has been problematic. How do you ship a large, awkward object like a mattress to your ecommerce customers without charging astronomical shipping fees? Brentwood uses innovative “bed-in-a-box” technology that allows each mattress to be compressed, rolled, sealed and boxed for shipping; it expands to its natural shape when the buyer unpacks and unrolls it. Figuring out how to ship mattresses wasn’t the only challenge Vy faced. Every ecommerce business will agree that designing the site is critical. What do you design in? What should you leave out? Brentwood Home has been refining its site from the start. The current version is its third major revision. If that sound vaguely Californian, it’s no accident. The site is perfectly explicit when it boasts: “We bring the ethos of California to all of our products." That must be the right message at the right time, because Brentwood Home was into the black within three years of its start—with 50 percent annual growth over the last several years. "The mattress industry is broken up into several brackets,” Vy explains. “You’ve got your big S's—Sealy, Serta, Tempur—big guys who dominate 70 percent of the market. And then you’ve got everybody else. 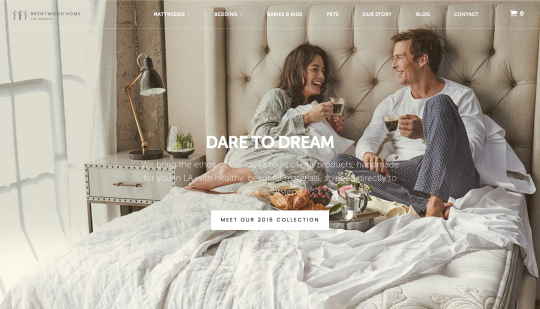 In this 'independent’ group, Brentwood Home has a different messaging: We’re a lifestyle brand that encompasses everything that creates an environment for a better night’s sleep. We’re developing products for everything in your bedroom, everything in your bathroom. We’re not just mattress-specific. Brentwood’s eco-driven core is more than mere philosophy. The company gives back to the local community, and the planet, by donating mattresses to local shelters and working with the National Forest Foundation to plant trees in areas of need across the country. That’s restful news for everyone. Including your dog.